You'll be £11.99 closer to your next £10.00 credit when you purchase Hitler’s Defeat on the Western Front, 1944–1945. What's this? 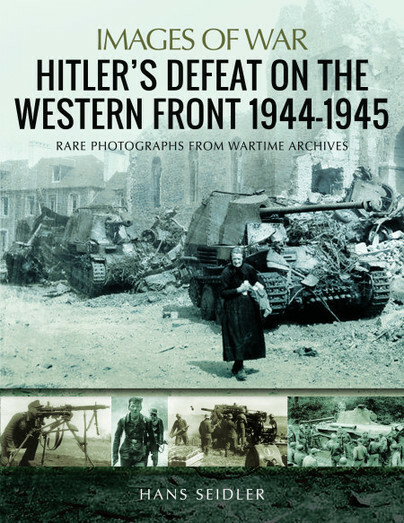 Hitler’s Defeat on the Western Front 1944-1945 is a compelling account of the Nazis’ ten month struggle against the overwhelming Allied military might on the Western Front. Thanks to the successful Images of War format of authoritative text supported by copious, well captioned contemporary images, the reader witnesses the intensity of the fighting from the Normandy beaches, through France and the Low Countries and finally into Germany itself. Despite demoralising withdrawals and reversals the Wehrmacht, Waffen-SS, Hitlerjugend, Volkssturm with many barely trained conscripts, continued to fight tenaciously inflicting significant losses on their superior enemy. The graphic images are testimony to their exhaustion and resilience but defeat became increasingly certain. Even when the Allies crossed the Rhine in early 1945 with the Russians closing on Berlin from the East, the shattered remnants of Hitler’s once all-conquering forces had nowhere to go. That did not stop fanatical elements fighting to the death but the bulk of the survivors accepted surrender as inevitable. This superbly illustrated book captures the drama of that historic period.